Fawlty Towers is a British Sitcom produced by the BBC which ran from 1975 to 1979. The British Film Institute declared it the Best British television programme ever made, in 2000. It is one of the jewels in the crown of British comedy. Although it only ran for two seasons, a total of 12 episodes, it withstands multiple viewings and is eminently quotable thanks to the sharp writing of John Cleese and Connie Booth. The show never descends into mawkishness at any time and perhaps one of the reasons for its success is to allow horrid human beings to act according to their natures at all times. John Cleese got the idea for the character of Basil Fawlty when the Monty Python team stayed at the Gleneagles Hotel in Torquay. The owner of the hotel, Donald Sinclair, fascinated Cleese with his incredibly rude behaviour. Basil fawns over the aristocratic Lord Melbury at the expense of the other guests, but there is more to him than meets the eye. Basil hires the cheap builders from O’Reilly for renovations to the hotel rather than the more expensive Stubbs and finds that you get what you pay for. Basil is determined that there will be no naughty goings-on at his highly respectable hotel. Some hotel inspectors are in town and Basil is determined to find out which of his guests are among them. In his never-ending quest to attract a higher class of customer, Basil organises a gourmet night. Unfortunately, his chef is unable to cook as he is in an alcoholic stupor, so Basil must find an alternative food source leading him to the verge of a nervous breakdown. Basil escapes from hospital with concussion. He causes his German guests much offence as he attempts not to mention the war. Basil’s guest from hell, the deaf Mrs. Richards, interferes with his attempts to keep his gambling winnings secret from Sybil. The arrival of a couple, one of whom is a practising psychiatrist, sends Basil into a spiral of manic behaviour. A brash American guest demands a higher standard of service than Fawlty Towers can provide, greatly irritating Basil. A guest dies at the hotel, so Basil and the staff must remove the body discreetly before anybody finds out. Basil organises a surprise wedding anniversary party for Sybil, but she leaves in a huff before the guests arrive. Basil decides to dress up Polly as Sybil and pretend she is ill to hide Sybil’s absence from the guests. Basil must keep the presence of a rat about the hotel secret from a health inspector. that Basil could possibly have achieved his objectives if the guests hadn’t got in his way. The flames of passion between Basil and his wife Sybil died many years ago and now he spends most of his time drawing Manuel and polly into his ridiculous schemes while keeping them secret from his suspicious wife. These schemes, of course, never work. 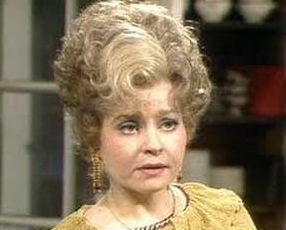 In The Builders for instance, Sybil is kept in the dark about who is doing building renovations in the hotel. In Communication Problems Basil desperately tries to keep his betting habits secret from Sybil. In both of these episodes, Polly acts as Basil’s reluctant conspirator. has a distinctive braying laugh and has the habit of saying Oooh I knoooow.. when she is on the phone which greatly irritates Basil. Sybil often looks back to the time when her relationship with Basil was more fulfilling. In the Anniversary, Basil pretends to forget that it is their fifteenth wedding anniversary in order to surprise Sybil with a party attended by all her friends. When this doesn’t go to plan, Basil has to revert to embarrassment minimisation, dragging Polly into his chicanery. Polly Sherman is a waitress and general helper around the hotel. She is probably the most competent member of staff, and it is she who becomes involved in Basil’s many pathetic attempts at trying to avoid embarrassment. She does so because of a misplaced sense of loyalty to Basil. In The Anniversary for instance, Polly ends up impersonating Sybil so that Basil avoids the embarrassment of having to admit to Sybil’s friends that he and Sybil had a row and she walked off in a huff. Needless to say, Basil’s scheming doesn’t go quite to plan. In the first series it is revealed that Polly is an art student and she tries to sell some of her impressionistic pictures to the guests without much success. Quite how she is still waitressing at Fawlty Towers by the second series with all that she has to put up with from Basil is anybody’s guess. by a waiter. He is an enthusiastic chap, grateful for the employment he has been given despite the opprobrium heaped upon him by Basil. The theme tune was composed by Dennis Wilson. The music was written especially for the show and taped a few days before the recording of the pilot episode. It was performed by Dennis Wilson and a string quartet on Thursday 19 December 1974.